Cybershells are everywhere in the world of Transhuman Space; some of them are player characters, while others are faithful allies or dangerous opponents. Shell-Tech lets you fill your games with these robotic marvels and monstrosities. 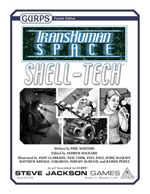 GURPS Third Edition supplements for Transhuman Space provided dozens of cybershell and bioshell templates. This book completes the job started in Changing Times of bringing these game details up to date with GURPS Fourth Edition, covering everything from the Medusa cybernetic hairstyle to the deadly spacefaring Jump RATS and the gigantic Cetapod bioshell. It also provides more, detailing a whole range of new specialist devices, from the handy wrist-mounted Cybertool to the Zero-G Stevedore, from the C-Brown robot gardener to the life-saving Medevac Shell. Whether you need something to build you a base on the moons of Neptune, watch your back in battle, spy on an undersea base, or just take great pictures from inside a tornado – you need Shell-Tech!